The British working-class intellectual, Thomas Alfred Jackson, was born in London in 1879. Tommy Jackson—always T. A. to the world—he is remembered as the working-class autodidact. As a young man, he read classics works mainly since contemporary literature was too expensive. (A survey found that while 55 percent of working-class adults read books, they rarely bought new books.) He built up an impressive library by haunting used-book stalls and generally scavenging. His obsession with books led him to rather neglect his attire and appearance! He was moved to radicalism by boyhood admiration for the Irish home-ruler, Parnell and developed into Second International Marxism out of opposition to the British aggression against the Boers. Jackson, early in life, declared himself Marxist Socialist. Reading secular material as a youth, he was profoundly influenced by the writings of Charles Darwin, Robert Blatchford and T. H. Huxley, leading to his gradual abandonment of mainstream politics and Christianity. He joined a study group connected with the Social Democratic Federation, studying history, economics, science, and political theory. In his autobiography, Jackson jumped wholeheartedly into debates concerning evolutionary socialism and scientific socialism, lecturing and writing on natural science and economics as part of a Marxist explanation for human existence. Certainly by 1900, Jackson was a member of the SDF. He was one of the founders in 1904 of the Socialist Party of Great Britain, a still extant but always tiny sect of Marxists believing in a long educational route to socialism. He is named in the Minutes of Inaugural Meeting held at Printers’ Hall, Bartletts Passage, Fetter Lane, London, E.C. at 6pm on Sunday 12th June 1904 and was at the First Annual Conference, 20 April 1905, Communist Club, 107 Charlotte St, London. He held some capacity not exactly as the secretary of the SPGB but certainly in an acting capacity in this period. T. A. Jackson was in despair at “an almost total failure to agree as to what ‘Socialism’ meant in terms of concrete, specific, political practice”. [John Callaghan, Socialism in Britain, Basil Blackwell (1990), pp. 27-29] Later, he was one of the founders of the British Communist Party and became a leading member and theoretician of the Communist Party for the rest of his life. An important part of the Salford based Working Class Movement Library is the T. A. Jackson Irish Collection, which contains some seven hundred volumes on Irish history, among them notable early works such as Wakefield’s Survey of Ireland. Jackson’s own rather famous book, Ireland—Her Own, was published in 1946. 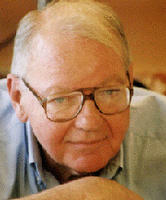 It has since been credited with winning many Irish republicans to left ideas. Although he had no Irish ancestors, he was from well before the Easter uprising a tireless promoter of Irish freedom. After meeting James Connolly on a tour of England, Jackson was won to the cause. Afterwards he was closely associated with Connolly’s closest lieutenant, Con Lehane, who suggested that he write a Marxist history of Ireland. That book became Ireland—Her Own, which is dedicated to Lehane. Jackson’s daughter married A. L. Morton, the celebrated Communist Party historian. 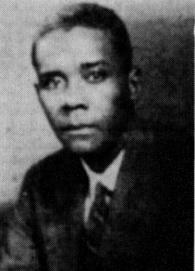 T. A. Jackson died in 1955 and the Communist Party honoured the centenary of Jackson’s birth in 1979. Further Reading: T. A. Jackson Archive. Secretary and member of Rosa Luxemburg's inner circle. Jacob eventually broke with Luxemburg but later authored an unpublished manuscript of her memoirs. She was expelled from the Communist Party of Germany in 1921, advocating a democratic form of communism. As a Jew, she was deported to a concentration camp in Theresenstadt. German idealist philosopher; friend of Goethe’s; precursor of Nietzsche and Dilthey. Jacobi held that the only sources of knowledge were on the one hand, immediate sensuous experience, and on the other, religious faith, and criticised rationalism holding that reason could not prove the existence of the objective world and nor could it comprehend religious feeling, which is the only guarantee of the existence of a world beyond sensation. New York-born critic of urban planning. 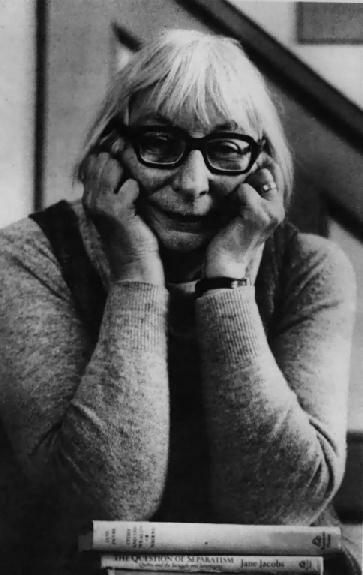 Born in 1916 in the coal mining town of Scranton, PA, Jane Jacobs completed high school in 1933 and studied geology, zoology, law, political science and economics at Columbia University. Her first job was for a trade magazine, first as a secretary, then as an editor. She also sold articles to the Sunday Herald Tribune. She then became a feature writer for the Office of War Information. In 1961 she published her most famous book, Death and Life of Great American Cities. The failure of Town Planning, her most recent book, Systems of Survival, was published in 1992. Blocking expressways, and supporting neighbourhoods has been a common theme in her life. In 1962 she was chairman of the successful Joint Committee to Stop the Lower Manhattan Expressway and she was again involved in stopping the Lower Manhattan Expressway, and arrested during a demonstration in 1968. Jacobs opposed Robert Moses, who had already forced through the Cross-Bronx Expressway and other motorways against neighbourhood opposition. A PBS documentary series on New York’s history devoted a full hour of its four-hour length to the battle between Moses and Jacobs. In 1969 Jacobs moved to Toronto, and was involved in stopping the Spadina Expressway, arguing that cities are for people not cars. Although cited as the originator of the term “social capital,” Jacobs’ concept of urban development is the struggle by neighbourhoods for “self-government,” and her ideas are far removed from advocating accumulation of any kind of capital. Became the chief leader of the Belgian CP after a majority of its leading committee was expelled for Trotskyism in 1928. Joined Bolshevik Leninist Party of India in Bombay. Entered SP with Bolshevik Leninist Party of India, 1948. Worked in the Central Railway Mazdoor Panchayat (All-India Railwaymen’s Federation). Born in Port Mourant, Guyana, Cheddi Jagan spent seven years studying in the US, where he became a Marxist and supporter of independence for his homeland. Upon his return home he formed a sugar cane workers union, and in 1947 was elected as an independent to the Legislative Council. He founded the People’s Progressive Party (PPP) in 1950, and in 1953 the party won the first elections under adult suffrage. 133 days later the British suspended the constitution, sent troops to Guyana, and removed the PPP from power. The PPP was split by Forbes Burnham in 1955, who was later, assisted by the British, to form the PPP’s main rival, the People’s National Congress (PNC). Jagan was elected prime Minister of Guyana in 1961, hoping to lead the country to independence, but his party and government – which were considered communist by the US – were the object of destabilization efforts, and Guyana went through several years of civil and racial turmoil. When independence finally came in 1966 Jagan was the leader of the opposition, and in 1969 the PPP declared itself Marxist-Leninist. By this time Burnham and his PNC had adopted leftist policies that led Jagan to give him qualified support. In 1992, 39 years after being forcibly removed from office, Jagan was elected Executive President. Joined Bolshevik Leninist Party of India in Calcutta after WWII. Organizer, Damkal Mazdur Union (firefighters) and Cox & Kings Union, 1947. Bolshevik Leninist Party of India organizer in Raniganj, 1947-48. Worked in Paper Mill Workers’ Union. Formed oil and colliery workers unions in Ranigunj. Entered SP with BLPI, 1948. Joined SP (Loyalists), 1952. Secretary, Bankura Distict (West Bengal) Socialist Party, 1952. Worked as independent trade-unionist in ‘fifties. Organized village workers and farmers in Bankura from his base at Pathardoba in ‘sixties; led militant strike in 1970 and was victimized by the United Front government of West Bengal. Russian-born linguist, principal founder of the Prague school of structural linguistics. Jakobson also held that Saussure's key insight that sounds had an essentially arbitrary relation to meaning, meaning being determined by their stuctural relations with other sounds which differed in this or that way, was an overstatement. In 1933, Jakobson became Professor of Russian Philology Masarykova University in Brno, Czechoslovakia, but the impending Nazi invasion forced him to flee Sweden, where he found work as visiting professor. In 1941 he reached the U.S. and taught at Columbia University until 1949 where the Lectures on Sound & Meaning were delivered. 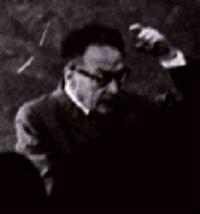 From 1949 till 1967, Jakobson held the position of Professor of Slavic languages and Linguistics at Harvard. Born in Trinidad in 1901, James was a brilliant novelist, playwright, historian and renowned cricket writer, but above all, a revolutionary and marxist of the first order. See the C L R James Biography by Anna Grimshaw and the C L R James Archive. Founder of Pragmatism, the characteristic philosophy of the American bourgeoisie, who took from Europe what “worked” in the New World. “If it worked then it was valid; if it didn't work, then it was garbage”. Mystic and founder of functionalism in psychology. James was the eldest son of Henry James, a supporter of Emanuel Swedenborg, and the brother of the novelist Henry James. James studied at the Harvard Medical School and travelled to Germany to study with the physicist and physiologist Hermann von Helmholtz; with the pathologist Rudolf Virchow, physciologist Claude Bernard and others, all the time reading widely in the psychology and philosophy. James suffered frequent bouts of illness and depression. His philosophical reflections on the question of Free Will became central for him in overcoming his depression and thereafter remained his spur in rejecting as unsound the entire existing body of science and theology and determining himself to re-work everything. His major work was carried out while teaching at Harvard and was published as The Principles of Psychology in 1890, a widely acclaimed monumental work in physiological, experimental psychology, considerably inspired by his own struggle to achieve mental and physical health by an act of Will. However, no sooner was this enormous work completed, than James lost interest in laboratory work and he turned to theology and investigation of life-after-death. It was from this standpoint that he approached Peirce's formulation of the basic ideas which would, under James' pen, become known as Pragmatism. James extended the one aspect of Peirce's thought (as explained in How to Make Our Ideas Clear), to assert that the meaning of any idea whatsoever lies only the succession of experiences of which it is a part. For James, the principal implication of Pragmatism was the rejection of all “absolutes” (or “metaphysics” as his positivist opposite numbers in Europe would say). In 1907 he published Pragmatism: A New Name for Old Ways of Thinking an excerpt from which is provided here. James soon achieved guru status, with the politically progressive and non-religious John Dewey taking up the Pragmatist cause and James' lectures were always great occasions, not only in the US but also in Britain where he also gained a following. In his later works, the mysticism of his earlier period returned, and instead of rejecting absolutes and metaphysics he now adhered to a kind of panpsychic view of a world composed of spirit. Illegitimate child, worked as farm labourer and then as cobbler. In SPD (Sozialistische Partei Deutschlands, Social-Democratic Party) in 1909. Soldier during 1913–16. Gassed and discharged, at this time associated in Bremen with Arbeiterpolitik group. Arrested, volunteered to join army and served as soldier up to November Revolution. Co-founder of IKD, member of KPD(S) at its foundation. Leader of Conciliar Republic in Bremen, then secretary of KPD(S) North-West district. Expelled after Heidelberg with ultra-leftists. Did not join KADP (Kommunistische Arbeiterpartei Deutschlands/Communist Workers Party of Germany ) , rejoined KPD(S) and resumed his responsibilities. Member of Central Committee after 1920. In 1922 secretary of ADGB trade unions in Remscheid. In 1923 secretary for trade-union work in KPD Rhineland-South Westphalia district, firm supporter of Brandler against Left. Expelled in 1924 for factional activity, re-admitted in 1925, worked for Workers’ International Relief. Illegal after 1933, then accused of having joined Nazis. Arrested in 1940, offered to ‘redeem’ himself. In Buchenwald until end of war. After 1945 in DDR, member of SED. Organizer of the Baku oilworkers from 1904, Bolshevik, and Chairman of the Baku Soviet. One of the 26 Baku Commissars who were murdered by counter-revolutionary forces in September 1918. German Existentialist, whose philosophy focussed on man's direct concern with his own existence; after the war he took a different direction with what he called “World-Philosophy”, concerned with people's need to be part of the world. Jaspers deliberately wrote in such a way as to foil attempts to criticise him, always writing at extreme length, and frequently making self-contradictory statements. From a well-to-do family in Northern Germany, Jaspers was a delicate and sickly child and suffered from ill-health throughout his life. Initially studying Law at Heidelberg and Munich, Jaspers switched to medicine and completed his studies in 1908, with a dissertation Nostalgia and Crime. From 1909 - 1915, Jaspers worrked as a volunteer at the University of Heidelberg Psychiatric Clinic, under Franz Nissl. Jaspers determined himself to develop a new system of psychopathology by introducing the methods of Husserl's Phenomenology into psychiatric practice and in 1913 published his General Psychopathology. 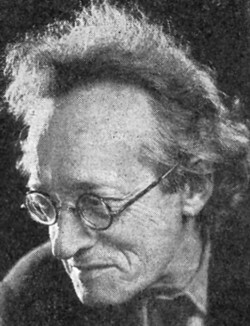 By 1921, Jaspers was Professor in Psychology in the Philosophy Department at the University Heidelberg where his major concern became defining the boundaries between psychology and philosophy. 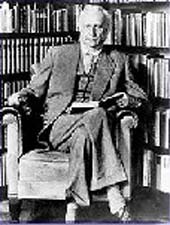 Following Max Weber, he asserted that scientific principles also applied to both the social and human sciences, but he held that philsoophy was concerned with the freedom which was unique to the thinking human being. During the 1920s Jaspers closely collaborated with Martin Heidegger, until breaking with him when Heidegger joined the Nazi Party. Jasper's wife was Jewish, and after Hitler's rise to power in 1933, he was excluded from the senior positions in the university but could still teach and publish. Unlike many others, he refused to make any concessions to the Nazis and he was eventually banned from publishing. His On My Philosophy is a short semi-autobiographical explanation of his philosophy dating from this time. Although he was given permission to travel to Switzerland in 1942, his wife was not allowed to accompany him and he refused to go. Both of them had decided that in event of being arrested they would commit suicide. After the war Jaspers felt deeply depressed by what he had witnessed. The irrationalism of the Nazis on one side and the inhumanity of modern science on the otther, drove him to seek for some other way towards truth. He also saw himself as having a responsibility in the rehabilitation of academic life in the aftermath of Nazism. In The Idea of the University, he called for a complete de-Nazification of teaching staff, but as it turned out, so few of the professors could claim a clean record, this was impossible! Jaspers then argued for acknowledgment of national guilt as necessary condition rehabilitation of Germany. In 1948, Jaspers left Germany to live in Switzerland where he began to work out his “world philosophy”. French socialist, radical activist of the French left. Founder of l'Humanité. Assassinated by the extreme nationalist Raoul Villain in 1914. He was born in Castres, France on September 3, 1859 and attended the École normale superieure in Paris and worked as a teacher at the lycée of Albi and as a lecturer at the University of Toulouse (1883-85). He was elected to the Chamber of Deputies in 1885 with no political affiliation. After his defeat in 1889, he returned to study and gained his doctorate in 1891, but was re-elected in a by-election in 1893, serving on and off until his assassination on the eve of the War in 1914. By 1893 he was a Socialist, aligned with the Independent Socialists, but was never a Marxist, believing that Marxism gave undue weight to the role of material interests in history, and favouring a gradualist approach to democratic socialism. In 1905 the two remaining socialist parties joined under his leadership, forming the Section Francaise de l'Internationale Ouvrière. In 1894 Jaurès leant his support to the campaign to free Alfred Dreyfus, a Jew jailed for treason based on forged evidence and this cost Jaures the election in 1898. Born in Colombo, son of Don John Delpachitra, a Buddhist employed in HM Customs office, who changed his name to Jayaratne when he married a Catholic. Educated Royal Primary School, Royal College, and University of Ceylon. Joined United Socialist Party (the Stalinist party), 1942. Joined Ceylon Unit of Bolshevik Leninist Party of India (LSSP), 1944. Councillor, Colombo Municipal Council, 1948-59. Participated in the Hartal of 1953. General Secretary, Ceylon Federation of Labor, 1954. Went to England for his PhD in Physics, 1961; while in London, served as the Lanka Sama Samaja Party representative to the United Secretariat of the Fourth International in Paris. Returned to Ceylon after the split in the LSSP in 1964, supported the LSSP(R). Rejoined the LSSP. Taught physics for 45 years at Pembroke Academy (Colombo), the University of Ceylon, the University of Peradeniya, and University of Colombo. Active in the Federation of University Teachers Association and later President. Helped organize the Institute of Workers Education, attached to Colombo University. Editor, LSSP theoretical journal Rajaya [State], 1975. Went blind in 2000; dictated several books, including The Nuclear Option (2004) and Memoirs of Osmund Jayaratne (2004). Remained with the LSSP to the end.